I was over at the Seahaven Blog where Merecraft had started the ball rolling (after a tip from Amraphael) to fix the limit of items placed within an inventory. 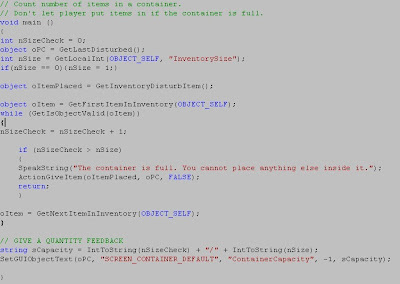 I posted a new script to his blog and repeat it below (because there was a slight bug in his) and I also updated the script so that it would give feedback of the items to quantity limit in the Container GUI. It meant updating the container.xml slightly more as well, and as I could not post it in a comment to him, I will try to post it here instead (as an image). NB: The quantity figure does not show until after the PC has interacted with the inventory in some way. One could script it to show the figure OnUsed, but I am not sure if the extra coding is necessary. Note, this alters an official XML file, and so it should be placed in a hak to be used with a specific module only. It only fixes the issue for modders and their scripted modules and does not fix modules that have not used the scripting initially. My thanks go to Merecraft & Amraphael for the inspiration. I've added your blog to my blog list too - I've got some catching up to do! Hey Lance! Your podcast will be out in about 2 hours! Thanks for being on the show! I hope it is interesting for the listeners.